Perfect choice I made, comfortable wide seat bought 4 barstools. Evoke the ambiance of a 1920s speakeasy right in your own backyard with this set of Sebastian bar stools from Christopher Knight. A lustrous copper finish paired with intricate lattice and rose vine detailing on the seat backs bring vintage warmth to every outdoor gathering. Generously padded off-white cushions, a swivel function and footrest ensure superior comfort for hours of al fresco enjoyment. 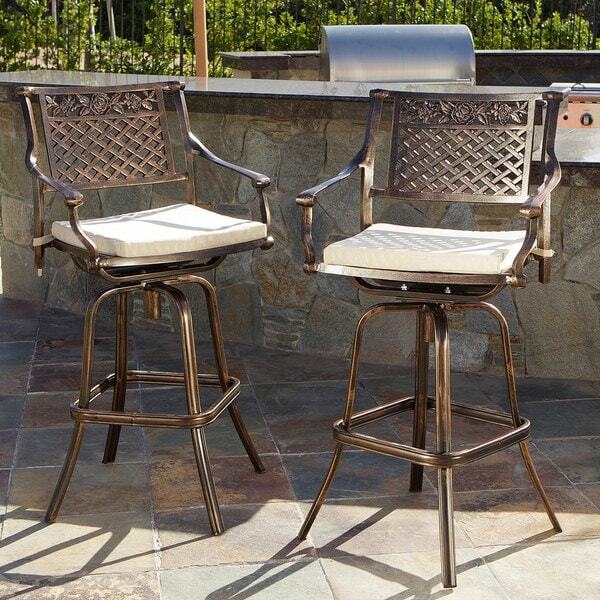 Dazzle guests with striking seating options when you place these bar stools in your poolside outdoor kitchen. The 23-pound frame provides stability, yet the stools remain light enough to quickly relocate when the party moves. Cast aluminum construction ensures these stools stand up to every weather condition. I've had the stools for about three months. Unfortunately it has rained about 60 of those 90 days. While they haven't been used as much as I'd have liked, they are holding up to the weather very well. I added a thicker cushion to match other furniture and the extra 2" seems too high as it is harder to get into the seat. I'm 5'8" and don't normally have an issue with stool heights. Another reviewer commented that the seats are very comfortable without cushions and I do agree with that. The seats have a nice contour and are comfortable. If they weren't in a (normally) sunny location I'd skip the cushion. They arrive in 2 prices and I had no issues assembling them. Bought this chairs for my Summer Kitchen... They look wonderful and are very well made for outdoor use. Nice Style and Height. Would recommend purchasing these chairs. As stated in another review the packaging is a little over the top, but the chairs are well worth it. I have bought a couple of Christopher Knight's products and they are well made for the price. I also have his leather barstools in my home and they are used daily and wear well. Good product. These seem to be very good quality stools. Being cast aluminum they should weather very well which is just what I need to sit by the lake. They are very simple to assemble; four nuts and bolts and you're done. Just slip the chair into the base and grab a beer. I love that they swivel. My only suggestion would be to make sure there is enough grease on the swivel post. I'm sure they will swivel easier as they get broken in. All in all, very satisfied. 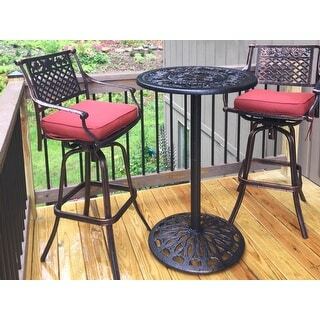 These elegant outdoor bar stools are very sturdy and easy to assemble. The chairs have a classic look to them and swivel easily when seated in them. The cushions are nicely plush for a longer length of comfortable seat time. Nice chairs and well made. Arrived on time and where packaged well. Easy to assemble, just attach the seat portion to the stool then tie down cushions. High recommend over barstools costing twice as much. I purchased a number of these stools to be placed around a poolside bar that gets a lot of traffic. The height swivel ( round ) is great. The fact that it's aluminum is critical. After ordering many different stools, we just got these barstools last week, and we finally found something we love. They function well, are good quality, and they look great in our outdoor bar by our pool! We found that stools that swivel work the best with our tall bar counter. They are a expensive, but worth it! 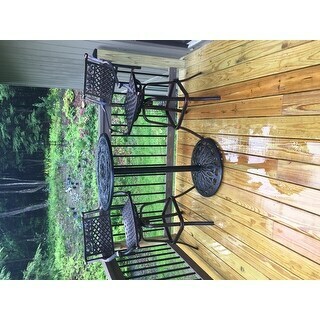 We recently built and outdoor kitchen and were looking for comfortable affordable bar chairs. These were both! They came with cushions which I thought I really wanted but we really like them better without the cushions. The quality of the chairs seems to be good and love the way they look. The chairs are well made, easy to assemble and nice to look at. Perfect for my new outdoor bar area. Comfortable with or without the cushions, which were included. Great quality stool at a reasonable price. After checking big box stores I decided to order from Overstock. I ordered one stool to start and have ordered six more to complete my set. I’m sure there is better out there but for the price this can’t be beat. Very happy customer. We loves these new barstools! Great price and with a cushion too! They are comfortable and sturdy. They arrived very fast and were very easy to put together. I'm sure we will enjoy these for many years to come. Ive purchased two sets and love them. Well MFG and comfortable. Easy to assemble and not to heavy. The perfect balcony height stools!! I did a lot of research and price comparisons and read the reviews of all kinds of bar height stools for our ocean fromt condo and I definetly made the perfect choice for these two chairs. They are so easy to put together, look beautiful on my balcony and the most perfect height, my husband is making me get two more!! Thanks Overstick!! These chairs are gorgeous! Made very well and match the rest of my Sebastian pieces perfectly! Worth every penny and sure to last a lifetime! Very nice quality. Easy to put together. Looks great with my patio heater that is bronze & has a table. These won't tip over like our light weight sling back bar stools. Shipping was fast,th set I ordered came within 2 days. Very impressed with Overstock. We bought 3 of these stools I am a big man ! 350lbs and they are very sturdy and comfortable, I plan on buying more of these in the future! Excellent product! Chair is ok. The paint flakes off rather easy. "Do you make an outdoor cover for these?" "What is the weight limit for these stools?" "What is the height from the ground to the top of the arm rest?" "is the seat cushion made of sunbrella material?" "Hello, without the cushion... what does the cast aluminum seat look like? The picture doesn't show what the seat looks like without the cushion... I assume it's a criss cross support of cast aluminum of the same color?" "I bought four of these. Three of them went together very easy. The fourth one doesn't want to slide in. Any suggestions?" 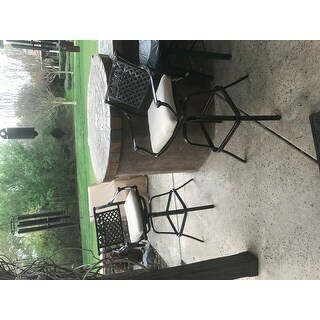 "I purchased 2 of these chairs from Overstock without the cushions. Now I would like to add cushions...do you know the color or style of the Sunbrella cushions that are shown?" It's a canvas sand cushion.